We’ve been nominated for FOUR awards this year at the UK Festival Awards – if you fancy voting for us that would be lovely. Voting is open now until 27 October at www.festivalawards.com/vote and then shortlists are announced on 04 November. Winners will be announced on the 01 December at the awards ceremony in London. If you want to after you’ve voted you can also enter the Dream Summer prize draw for 2 VIP tickets to every festival that wins an award, as well as a new iPad mini. 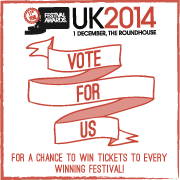 We’re up for Best Family Festival, Best Medium, Grass Roots Award and Best Toilets!